Sometimes it pays to go through those Valpak coupons in the light blue envelope that come along with the Weekly Grocery Ad mail spam ads. 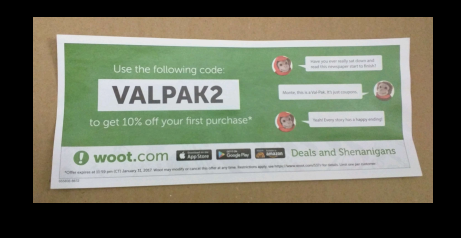 There is a coupon from Woot, coupon code VALPAK2 gets you 10% off your first order at Woot. The coupon expires 1/31/17. Restrictions apply. You can see all the terms and conditions at this url: http://www.woot.com/537.r (there is a dot before the “r”). NOTE: this redirects to a Cloudfront.net page and opens a PDF file; I am not putting a “live link” so people don’t get spooked by clicking on it and then all of sudden finding a Cloudfront PDF file in their browser tabs. Limit one per customer. This is only good for first-time customers there.